Welcome to my stop on the Colour blog series hosted by Michelle Wilkie at Factotum of Arts. 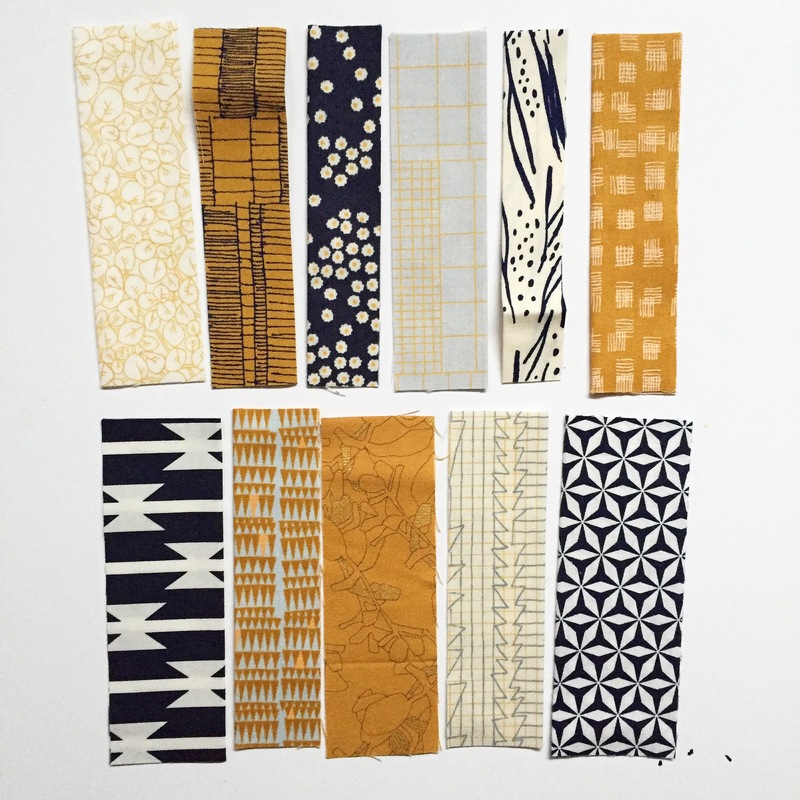 February is all about yellow, a color that is very closely tied to my quilting life. You can read Michelle’s introduction post about yellow here. I didn’t even know that I liked the color yellow until I started quilting. When I decided I would make a quilt, I made the decision in a vacuum, without knowing that there was a whole quilting world on the other side of my computer that was full of education and inspiration. I wanted to find fabrics that I loved and found interesting enough to stare at for awhile. For my first quilt, I was drawn to a Joel Dewberry hummingbird print that I don’t see anywhere any more. There was a golden yellow, a lighter yellow, some mustard, some brown, and a hit of hot pink that I really loved. I also used a Cloud9 chrysanthemum print and a large damask print. It was dark but also bright, and I think the contrast is what hooked me on choosing fabric and trying different combinations of fabric. I loved how the yellow brightened up the space it was in and demanded attention. It also had a warmth to it, like it would bring extra magic glowing powers to the quilt, this instrument of snuggle. Most of the quilts I’ve made have yellow that sneaked its way into the palette. Like Michelle highlighted in her post, it works really well with neutrals, blues, and pinks. I thought I would describe my process in using yellow in my own quilts. Get ready for a trip down memory lane. There are four ways that I’ve used yellow in my quilts. In the Poppstrong quilt, it was a needed bright against a lot of black and darker saturated colors. When trying to make my husband a black and white quilt (Love Letters), I just had to add some yellow for interest and to keep it from being too drab (the back is entirely yellow, which I find so warm and welcoming and perfect). When trying to make a quilt that was all shades of green and greenish blues (Green Peek), I couldn’t resist adding a focal print that relied on yellow to stand out and draw some attention (appropriately, it’s called Overacheiver from Anna Maria Horner’s Honor Roll collection). And when I made Rally, my choice for an accent block was an Amber shade. It really stands out against the navy and light blue. In Floret, I love how the mustardy-yellow plays with the saturated teal and pinks in different ways, and the yellow binding draws everything together for me. In my Aerial quilt (pattern by Carolyn Friedlander), It was both a contrast to neutrals and cool colors and a companion bright for the salmon pink. I used two shades of gold that got to be on their own in some blocks and juxtaposed in others. In You Are My Sunshine, I utilized the contrast of sunny yellow and cool gray for a gender neutral baby quilt. And for another gender neutral baby quilt (the BFF quilt), I contrasted it with gray but also paired it with another bright, aqua, to bring softness without too much femininity. While I do believe there is a thing as too much yellow, I have been drawn to pieces in which different shades of yellow work together for an overall effect. This painting hangs in my living room. It’s by Haley Nannig, a young painter who is also from Rhode Island and just happens to be my cousin. She uses the teals, gray, and a tiny bit of purple in the clouds for contrast, but she also uses at least five shades of yellow. There are two brownish shades in the sand, a higher value pale yellow in the sky, more orange near the clouds, and the bright space around the edge of the canvas. It is bright and interesting and all the best that yellow has to offer. It’s energetic but calm. Just imagine how gorgeous a quilt would be in this palette! Even before I had seen Haley’s painting, I used different shades of yellow in Flounce, in part as a color study, and partly to add depth to the design. (Cirrus Solids in Sprout, Grass and Amber.) You can see how they distinguish from one another and what the green and teal bring out in each of them. Whether it’s the star of the show or a supporting player, yellow demands a lot of attention. So if you’re looking for some sun in your next quilt, here are some tips. Contrast contrast contrast! Play with complimentary colors and neutrals that let your yellow sing. Consider hue and value: How bright, how warm, how orange or green. Use in appropriate doses for your taste. Balance with complimentary or neutral colors. I hope you have fun playing with yellow! 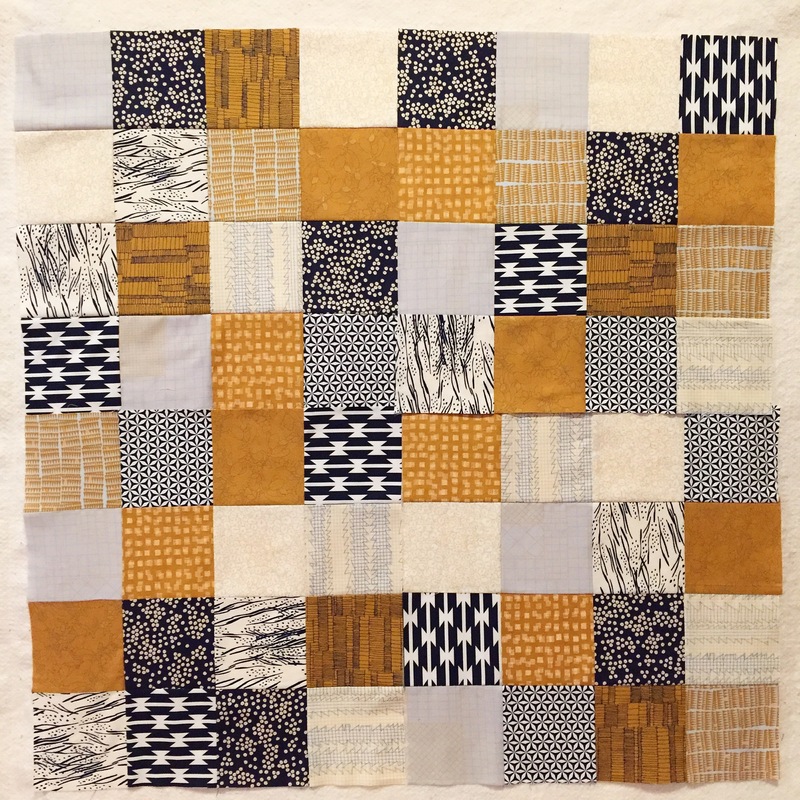 One of my current projects is this traditional patchwork quilt in a palette that includes mustards and paler shades of yellow in combination with white, navy, and a pale grayish blue. Stay tuned to the Colour blog series all year! It will spotlight a different color each month, first with a post on Factotum of Arts and then with a guest blogger. Make sure you’re getting updates from Michelle, and check out the posts from this stellar lineup of talented quilters. Huge thanks to her for including me! Love your examples 🙂 Thank you !! Ever since you posted this I see yellow everywhere! Love the way you use it. Makes me smile. Well done! This is a very interesting post. Your examples all work so well and your thoughts highlight the points you are making in the quilts. Love your examples of how to use colors together. It’s going to make me think about my color choices. Look forward to your next installment. I enjoyed your post – thank you! Yellow and mustard-isn shade especially are my absolute go to colors that I’m drawn to. Your quilt was one of my favorites at QConWest.